Choroid plexus papilloma (CPP) represents an uncommon pediatric brain tumor with an overall incidence less than 1% of all intracranial tumors. Most of these tumors occur in the lateral ventricles in neonates. Third ventricular location is uncommon, limited to a few case reports. These highly vascular tumors retain the physiological function of choroid plexus and thus lead to overproduction of cerebrospinal fluid (CSF), besides obstructing the CSF pathway. Imaging is fairly sensitive and specific in affording the diagnosis of this tumor. Surgical approaches differ according to the site of tumor and aim is complete removal of tumor. We present an interesting report of an infant who presented to our department for cranial sonography that lead to suspicion of this tumor, later confirmed by other imaging modalities and histopathology. Choroid plexus papillomas (CPP) and choroid plexus carcinoma (CPC)) comprise 2-4% of all pediatric brain tumors. Of these, 10-20% occur in the 1 st year of life. CPP and CPC occur in a ratio of 5:1. Most of these tumors occur in patients less than 2 years of age. Most common location is lateral ventricle, followed by fourth ventricle. Other locations are rather rare. Sporadic case reports have described third ventricular CPP. ,, These tumors produce symptoms even when small because of their strategic location as well as cerebrospinal fluid (CSF) over production. Diagnosis rests on imaging studies that show the mass in the location of third ventricle with typical imaging features on sonography, computed tomography (CT), and magnetic resonance imaging (MRI). Treatment is complete surgical excision of tumor. Radiosurgery can achieve reduction in size as well as vascularity of lesion to allow less complicated procedure. A 7-week-old full term male presented with downward gaze since birth and progressive increase in head size. On examination, the child was normal weight but was lethargic. There was bulging of anterior fontanelle. 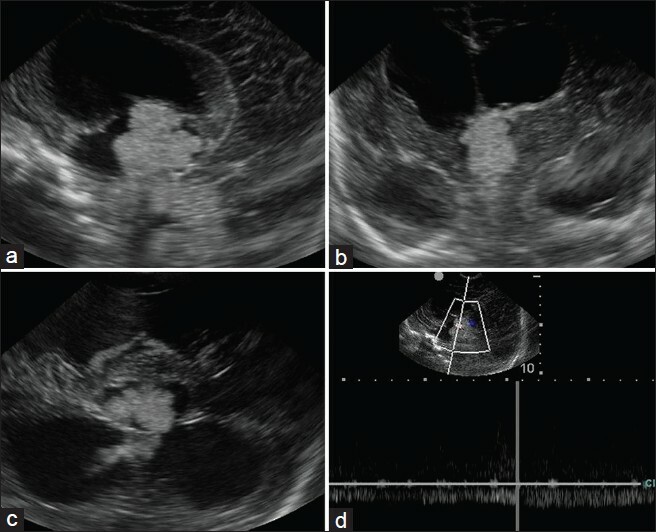 Cranial sonography revealed dilatation of bilateral lateral ventricles with an echogenic lobulated mass in the third ventricle with internal vascularity [Figure 1]. No evidence of hemorrhage was noted in the ventricular system or brain parenchyma. A diagnosis of choroid plexus papilloma was suspected and a contrast-enhanced CT (CECT) confirmed the enhancing mass in the third ventricle with hydrocephalus [Figure 2]. To know the exact extent of the tumor as a part of preoperative evaluation, a contrast-enhanced MRI was performed. A lobulated mass was noted in the third ventricle, hypointense on T1 weighted and mildly hyperintense on T2 with intense enhancement on administration of intravenous gadolinium. Contrast-enhanced images depict the extension into the fourth ventricle [Figure 3]. Child underwent a shunt procedure followed by right frontal craniotomy with transcortical transforaminal total excision of the tumor. The main feeding vessel was posterior choroidal artery that was identified after debulking of the tumor. Artery was coagulated and cut. Floor of third ventricle was seen bare and lamina terminalis translucent. 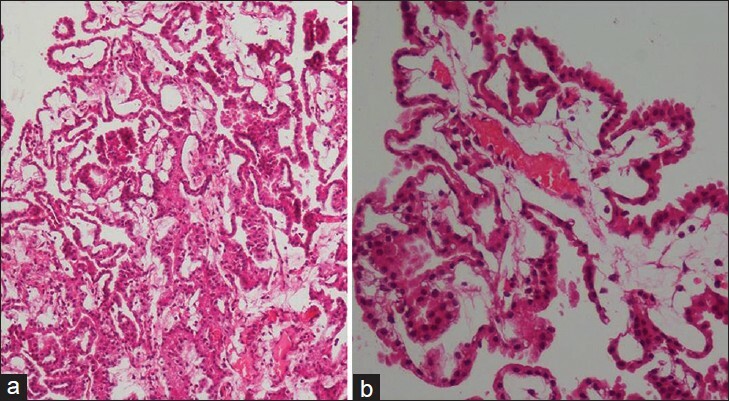 The histopathology of the resected tumor showed tumor cells arranged in multiple papillae with fine fibrovascular core, confirming the diagnosis of CPP [Figure 4]. 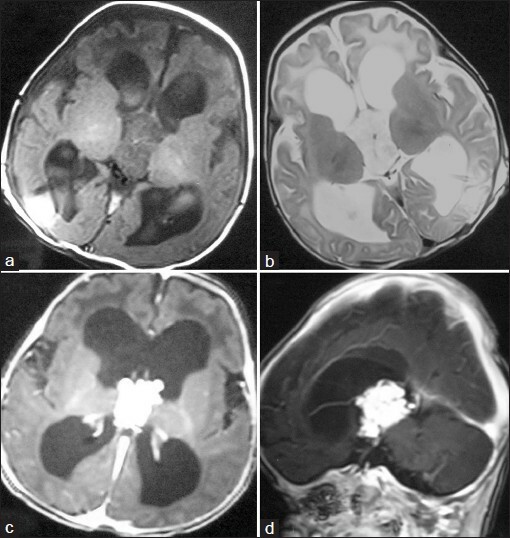 Postoperative course of the child was uneventful and follow-up CT revealed no residual tumor. CPP is a rare tumor of neuroectodermal origin, accounting for less than 1% of all intracranial neoplasms. It has predilection for lateral ventricle in infants and children and fourth ventricle in adults. Multiple CPPs have also been reported. However, description of third ventricular CPP is limited to a few case reports or case series. ,, Thus, a third ventricle CPP is a rare diagnosis. These tumors typically present in neonatal or early childhood period, pointing to their congenital origin. These lesions typically manifest with increasing head size, lethargy, decreased activity, and poor psychomotor milestones in infants. As the child grows older, visual impairment and gait disturbances are noted, related to raised intracranial pressure (ICP) and direct pressure caused by the tumor. Hydrocephalus and raised ICP in these cases is caused by two mechanisms: Direct obstruction of CSF pathway and overproduction of CSF by tumor cells that tend to maintain function of choroid plexus. Because of their strategic location, very small lesions can be symptomatic and likely to be missed. Most of the lesions that have been described measure between 2 and 5 cm. Razzaq and Chishti, reported a giant CPP of third ventricle measuring 8 × 5 × 5 cm. Certain interesting symptoms and signs associated with third ventricle CPPs have been described in literature. Bobble-head doll syndrome and drop attacks were noted in a 2-year-old child by Pollack et al. This was hypothesized to be due to intermittent obstruction of foramen of Monro and proximal aqueduct. Behavioral disturbances have also been described, probably related to proximity and pressure by the tumor on hypothalamus. These symptoms or signs tend to regress abruptly or slowly following tumor removal. Imaging plays a vital role in differentiating between obstructive (noncommunicating) and nonobstructive (communicating) hydrocephalus. Ultrasonography (USG) is the modality of choice in utero, neonatal, and early infancy. It elucidates the anatomy of ventricular system well. One of the greatest strengths of USG is the monitoring of hydrocephalus in the most noninvasive way, with no need for sedation and without the use of radiation. Besides, USG can detect small intraventricular lesions that can sometimes be missed on noncontrast CT, as was the case in our patient. CPPs appear as echogenic masses with lobulated outline. Their echogenicity and other morphological features closely match the normal choroid plexus. Color Doppler interrogation reveals these lesions to be markedly vascular. CT plays an important role in older children where the acoustic window for USG is lost. CECT depicts these lesions as avidly enhancing lobulated masses. The degree of heterogeneity is variable depending on the size of tumor, and if marked, should lead to a suspicion of CPC, particularly if there is adjacent invasion. MRI is the modality of choice in older children for central nervous system imaging in general and intracranial tumors in particular. This is related to the ability of MRI to provide multiparametric imaging affording a preoperative typing and grading of tumor, planning of biopsy, and surgery. Management usually comprises CSF diversion procedure prior to definitive tumor excision. Complete removal of tumor is advocated and various approaches to third ventricular tumors include transcallosal, transfrontal, transforaminal routes, and supracerebellar infratentorial. , In individual cases, the surgical approach would depend on location, size, vascularity, and extension of tumor through the foramen of Monro. Recently, microsurgical techniques have also been described to improve the outcome. Another innovative therapy is radiosurgery that aims at avascular necrosis and shrinkage of tumor and is best as an adjunct to surgery. Prognosis following removal of tumor is favorable. 1. Rickert CH, Paulus W. Epidemiology of central nervous system tumors in childhood and adolescence based on the new WHO classification. Childs Nerv Syst 2001;17:503-11. 2. Janisch W, Staneczek W. Primary tumors of the choroid plexus. Frequency, localization and age. Zentralbl Allg Pathol 1989;135:235-40. 3. Aguzzi A, Brandner S, Paulus W. Choroid plexus tumours. In: Kleihues P, Cavenee WK, editors. Pathology and genetics of tumours of the nervous system. Lyon: IARC Press, 2000. 4. Fortuna A, Celli P, Ferrante L, Turano C. A review of papillomas of the third ventricle. J Neurosurg Sci 1979;23:61-76. 5. Gradin WC, Taylon C, Fruin AH. Choroid plexus papilloma of the third ventricle. Neurosurgery 1983;12:217-20. 6. Costa JM, Ley L, Claramunt E, Lafuente J. Choroid plexus papilloma of III ventricle in infants. Report of three cases. Childs Nerv Syst 1997;13:244-9. 7. Yoshino A, Katayama Y, Watanabe T, Kurhhare J, Kimura S. Multiple choroid plexus papillomas of third ventricle distinct from villous hypertrophy. J Neurosurg 1998;88:581-5. 8. Milhorat TH, Hammock MK, Davis Da, Fenstermacher JD. Choroid plexus papilloma: Proof of cerebrospinal fluid overproduction. Childs Brain 1976;2:273-89. 9. Razzaq AA, Chishti KN. Giant choroid plexus papilloma of the third ventricle. J Pak Med Assoc 2003;53:573-5. 10. Pollack IF, Schor NF, Martinez AJ, Towbin R. bobble-head syndrome and drop attacks in a child with choroid plexus papilloma of third ventricle. J Neurosurg 1995;83:729-32. 11. Apuzzo MLJ, Chikovani OK, Gott PS, Teng EL, Zee CS, Giannotta SL, et al. Transcallosal, interforniceal approaches for lesions affecting the third ventricle: Surgical considerations and consequences. Neurosurgery 1982;10:547-54. 12. Mohindra S, Savardekar A. Management problems in a case of third ventricular choroid plexus papilloma. J Pediatr Neurosci 2012;7:40-2.